Almost half of the county's growth since 2010 is made up of people born outside of the United States. Only two other counties have seen a bigger increase. There are a lot of stories behind the Seattle area’s unprecedented growth this decade. There’s Amazon and the tech industry, of course. Then there are the millennials — we’ve attracted more of them than any other city. But as much as anything, it’s also a story of immigrants. King County’s total population has grown by about a quarter million since 2010. Almost half of that growth — 49 percent — is from people who were born in another country. There are only two counties in the U.S. — Miami-Dade in Florida and Harris in Texas — that have seen a bigger increase in the number of foreign-born inhabitants. 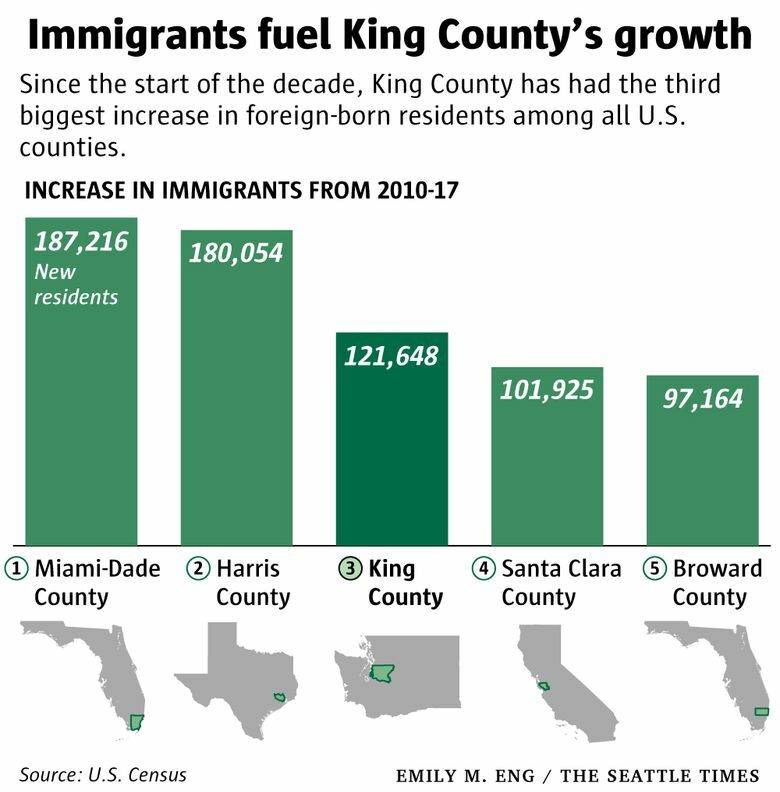 And with that surge in population, King County has hit a new milestone of diversity: We’ve passed the half-million mark for the number of foreign-born residents. According to the most recent census data, the county’s immigrant population was 516,000 in 2017. That means that nearly one in four inhabitants of the county (24 percent) were born outside the United States, significantly higher than the national average of 14 percent. 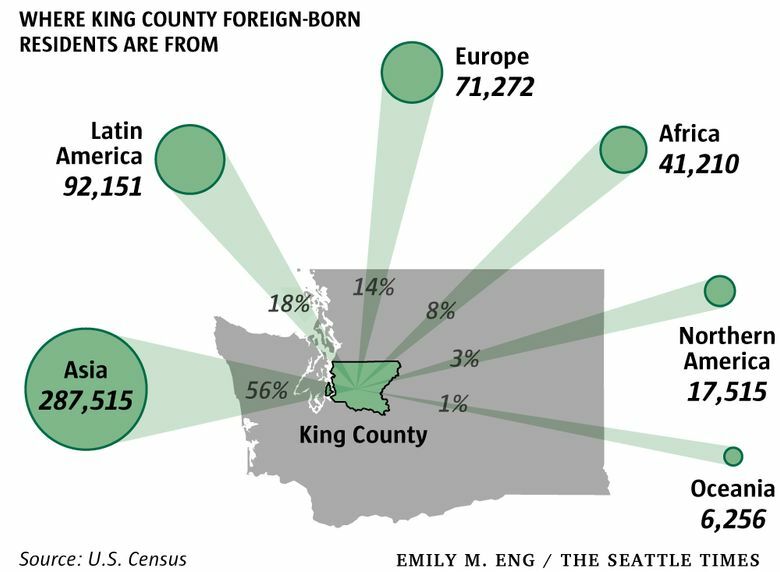 In a number of cities in South King County, and in Bellevue and Redmond, the percentage of foreign born is around 40 percent or higher. Among those one in four is U.S. Rep. Pramila Jayapal, the congresswoman from Washington’s seventh district, which includes most of Seattle as well as some suburban areas. She is one of about a dozen representatives in the House who are naturalized U.S. citizens, and the first Indian-American woman to hold the office. Jayapal came to this country from her native India at the age of 16, by herself, to go to college. “My parents saved whatever they had, which was about $5,000 at the time, to send me here,” she said. “They really believed in America and the educational system here.” Jayapal settled in Seattle in 1990. Her parents still live in India. “For many years I had enough money for one phone call home a year — there was no Skype back then,” she said. Jayapal says that the Seattle area is remarkable for how it attracts immigrants from so many different parts of the world, and she thinks that’s due to more than just our booming economy. 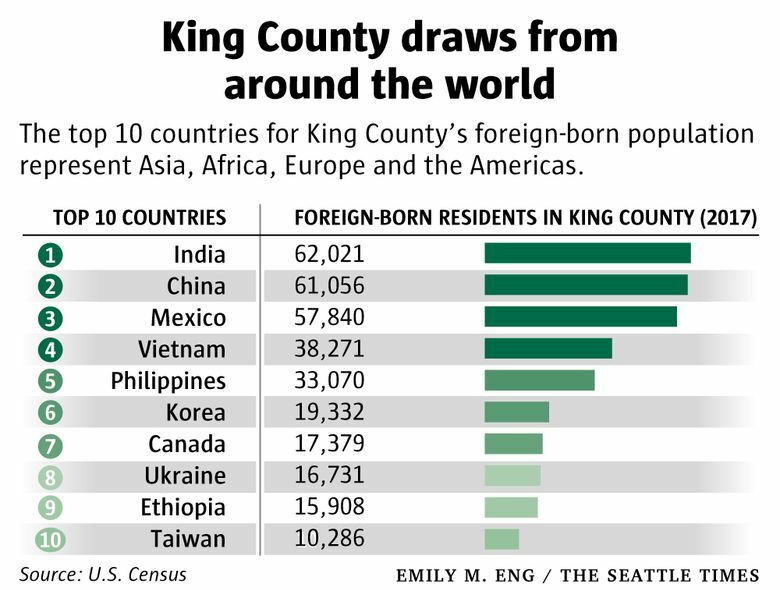 Census data show that the top 10 places of birth for King County’s foreign-born residents include countries in Asia, Africa, Europe and the Americas. A little more than half of our immigrants come from Asia, with India and China the top two nations. Mexico ranks third. Jayapal says that King County’s foreign-born residents have contributed to the Seattle boom at all points along the economic spectrum, from tech to health care to the service sector. Many come here and must restart their lives. It was her advocacy for immigrant rights that propelled Jayapal into the spotlight locally. After the Sept. 11 terrorist attacks, she founded Hate Free Zone (now OneAmerica), one of the first multiethnic immigrant rights groups in the country. And that advocacy continues in Congress, where she has gone on to become one of the most outspoken critics of the Trump administration’s immigration policies. She has strongly condemned the disparaging rhetoric about immigrants from President Trump and other Republicans in Congress. “I cannot believe the hatred and the lies that people tell about immigrants and the fact that they leave out all of the good things and the contributions,” she said. Jayapal’s actions defending immigrant and refugee rights against the Trump administration, along with numerous appearances on cable news shows, have catapulted her to national prominence, and she’s considered a rising star in the Democratic Party. And while it has also made her a controversial figure, she says she gets nothing but love from back home in Seattle. An immigrant herself, Jayapal says that her resistance to the Trump administration’s rhetoric and policies does feel personal.